Tune in this Friday February 7th to Fox 45 Evening News at 10:00 ~ when I will be discussing the issues of insuring your pregnant wife and children with or without a subsidy. then there is no reason to use the Maryland Health Connection website. By dealing directly with the insurance brokers like me where no subsidy is available, there is no issue about putting pregnant women or your children on your insurance plan. Identity theft has also not been a problem when we enroll clients directly with insurance companies. I am trying to have the ACA Obamacare law changed to the extent that when applying for a subsidy and Medicaid/Chip is offered, the client has the option of having the children and/or pregnant woman on the insurance plan with their family and still receive a subsidy. Additionally, I will be bringing this to the attention of the Board of Directors of the Md. Exchange at their meeting on the 18th of this month asking them to allow people to have the option mentioned above. 2.Rebate/Discount available to middle and lower income people. 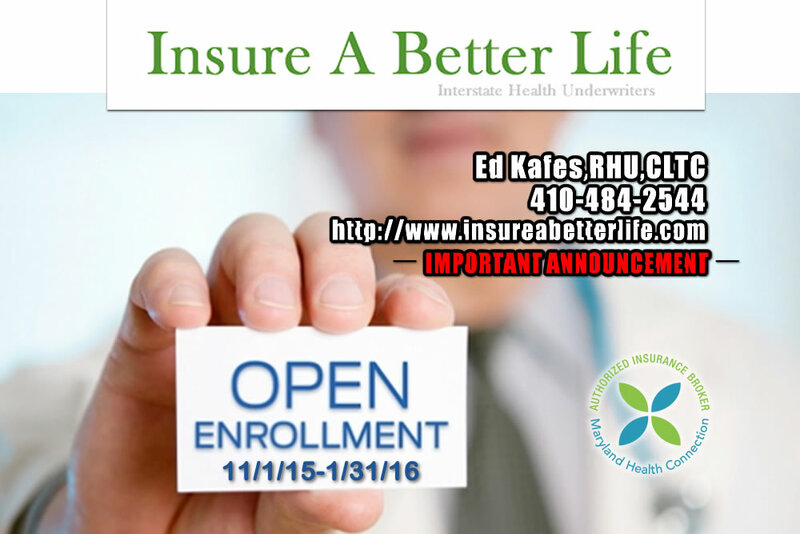 3.Encourages people to enroll in a health insurance plan. 4.When enrolled plans encourage people to get a check-up. Preventive services covered @ no deductible or co-pay. 6.Leads to Single-Payor within 3- 5 years. Trade in your old life insurance policy for a brand new modern one. for long term care expenses while you live. This might be when you need it the most. Or what choices are available to them. Over the phone or in person..
Do I need to sign up for Medicare part B, the doctor part, which has a monthly cost and that cost is based on income ? What Part D drug plan do I need if any. And the cost of this plan is also based on income..
Should I consider buying out Long Term Care Insurance? What happens to my other company benefits at this crossroads? The above issues need to be discussed well in advance of turning 65 with someone knowledgeable on these issues, as the proper answers might save thousands of dollars.. Many people pay for permanent life insurance policies that have an interest component. Interest being where it is today is slowly putting these policies underwater. By that I mean at some point many of these policies will have no value -0-. No cash value and no death benefit. The current policies of this type being sold today are now typically guaranteed to age 105 or higher. It is critical for most people to have their life insurance policies reviewed by a life insurance professional to make sure that their policies will achieve their expectations. Otherwise they or their beneficiary may be terribly disappointed.